You’ve no doubt seen them on the hard shoulder or looping the motorway, occasionally you’ll catch their amber lights in your rear-view mirror too, but that’s only half the story. 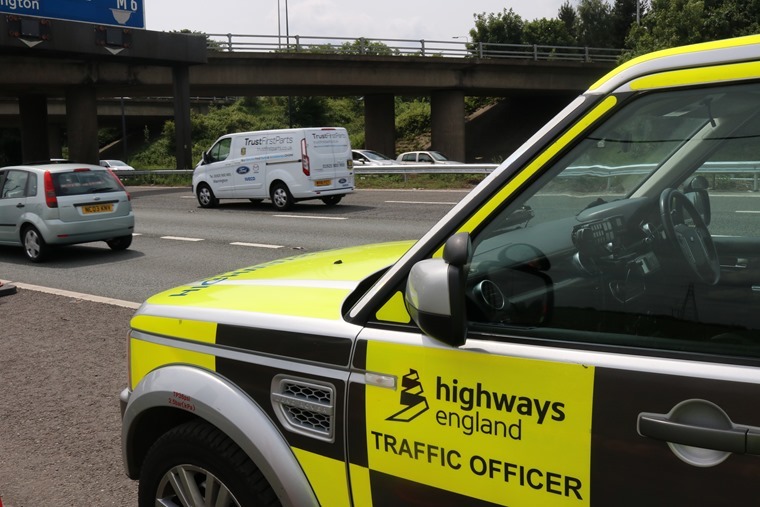 So do you actually know what Highways England Traffic Officers do? Many misconceptions have sprung up since Traffic Officers first took to the roads in the West Midlands in 2004 – the terms ‘traffic wombles’ and ‘fake speed trap’ wrongly and often seem to crop up when you mention them thanks to that gangly wirey-haired fellow with the pot belly on the Grand Tour Gear – so to put a few of those misconceptions to rest we spent the day touring Highways England North West Regional Control Centre as well as patrolling the M60 and M6 with its Traffic Officers. Responsible for operating, maintaining and improving the strategic road network of motorways and major roads, Highways England provides traffic information services, liaises with other government agencies and provides staff to deal with incidents on the roads it manages – a network remit which totals around 4,300 miles. While this represents only 2 per cent of all roads in England by length, these carry a third of all traffic by mileage and two thirds of all heavy goods traffic. Needless to say it takes a combined effort to keep this all moving and as such responsibility is divvied up into six regions which are then subdivided into 13 operational areas. All of this is told to me by Neil Sterio, press and PR Officer for the North West, as we tour the control centre hidden away just off the A580 and with quick and easy access to the M6. 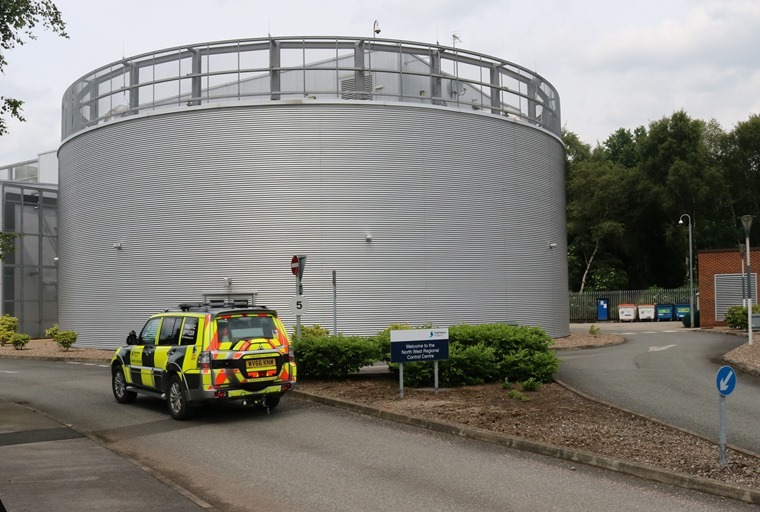 The building, a towering metal silo which gleams in the sunlight, is built for purpose and that purpose is two-fold – one, to provide a state-of-the-art rapid response service to incidents and two, to fit into the surrounding area as seamlessly as possible. As such, we proceed to the first part of the itinerary and get a bird’s eye view over the control centre. 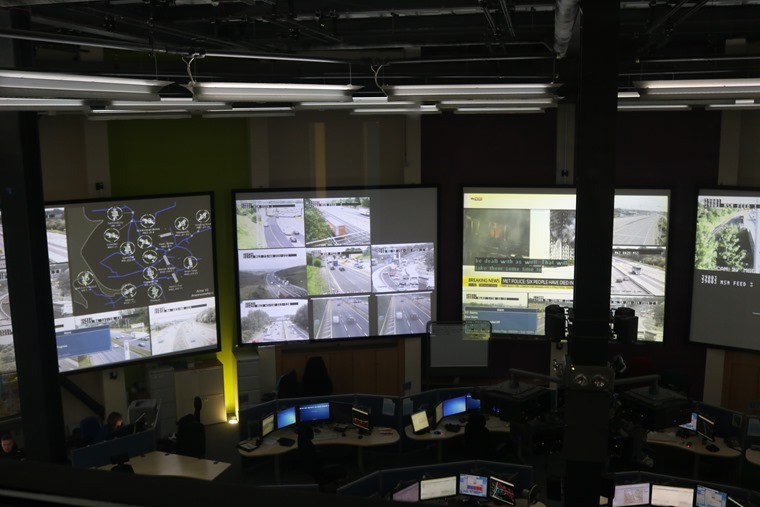 The first thing that springs to mind is 24 or Spooks – huge screens on the wall display live feeds of weather and traffic conditions across the area, with 24/7 news displayed in the centre. Response staff sit beneath these and in front of computers, answering calls from emergency roadside telephones, managing incidents, updating variable-message signs, logging calls, reporting breakdowns, and keeping officers on the road up to date and informed. Liaising and co-operating with partners such as the police and maintenance contractors is a key part of Highways England’s effectiveness. As such the North West control room is shared with the North West Motorway Police Group and Highways England contractors, allowing shared intelligence about incidents and road and weather conditions for the dispatch of the most appropriate resource to any incidents. 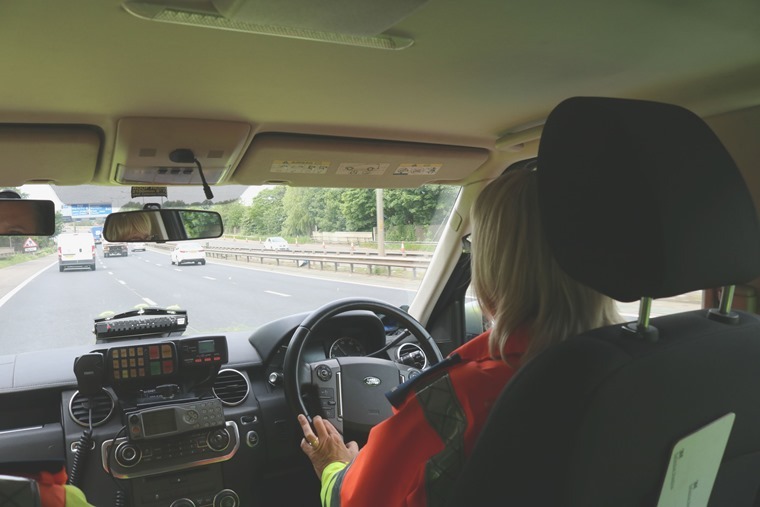 This could be managing and investigating major road traffic collisions or tackling criminality on the network - anything from a driver being spotted using a mobile phone to potential drunk drivers swaying in and out of lanes. All of this combines to offer a comprehensive overview of the road network ensuring issues that arise are dealt with promptly and are brought to the attention of the Traffic Officers on-the-road immediately. And what do the Traffic Officers use to get to any and all of the situations raised with them? 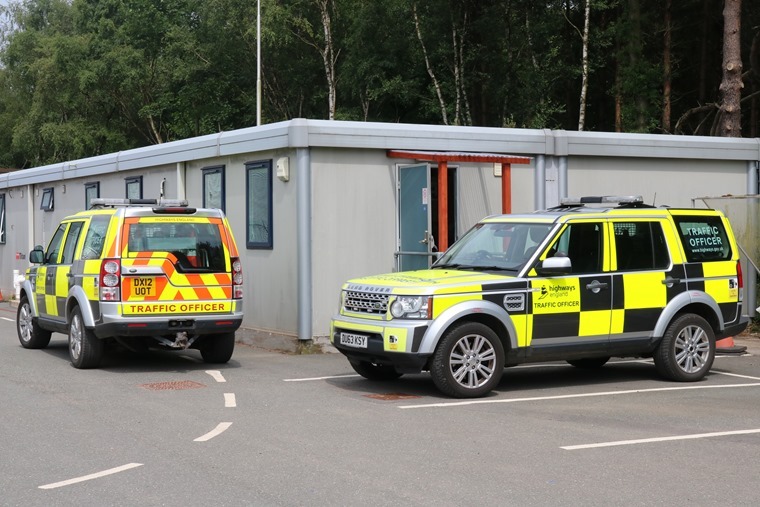 On fleet currently at the North West Regional Control Centre are Mitsubishi Shogun’s and Land Rover Discovery 4’s, and while they may be due an upgrade and have trialled more modern vehicles nothing appears to compare to the towing capability, practicality and comfort offered by these examples of off-road excellence. For our patrol, I’m placed with Traffic Officer’s Stephen Davies and Pamela Brides and it’s the Land Rover Discovery 4 we find ourselves in. The boot is filled with the kind of objects you’d expect – cones, crowbars, arrow signage and, of course, a trusty supply of blue roll. Loaded up and seatbelts on, we take a secret slip-road out onto the M6 and start covering our required junctions. In the truck I’m informed that I’ve missed the biggest call-out of the day so far – a five car pile-up on the M60 in the early rush hour traffic at Junction 1 near Stockport Pyramid – but we’re not long on the M6 before we spot our first issue of the day, albeit something nowhere near as serious, and check on a gentleman in a classic MG convertible who has pulled up on the hard shoulder just before a junction exit. 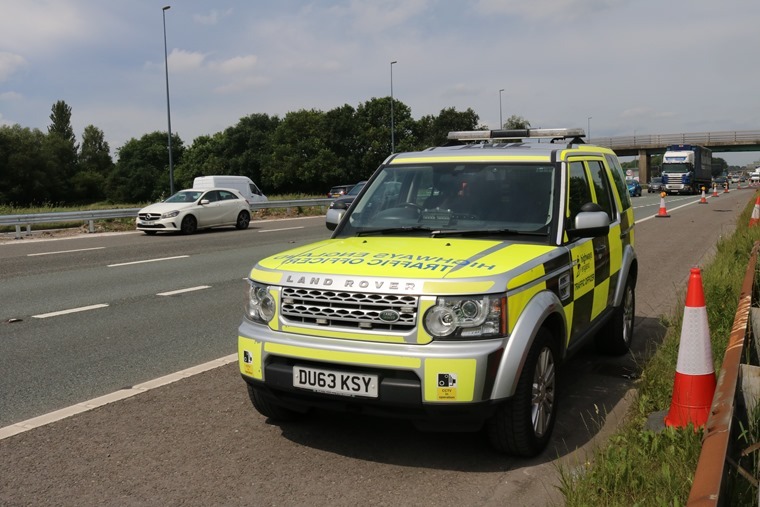 Stepping behind the safety barrier, the team log the issue with the response team at HQ and check with the driver what the issue is and if road-side assistance is needed. The man informs us that a tow truck is on its way and we are soon on ours. Pamela, who is driving the Discovery 4, informs me that she prefers driving the Mitsubishi Shogun for comfort and convenience but the torque of the Land Rover is a lot better for pulling away from the hard shoulder and getting quickly back up to speed to rejoin the motorway. This she ably demonstrates and once more we are patrolling the roads. We use a byway to cut across and emerge on the clockwise side of the M60 to join the M56 and M6 and make our way over to the Thelwall Viaduct. 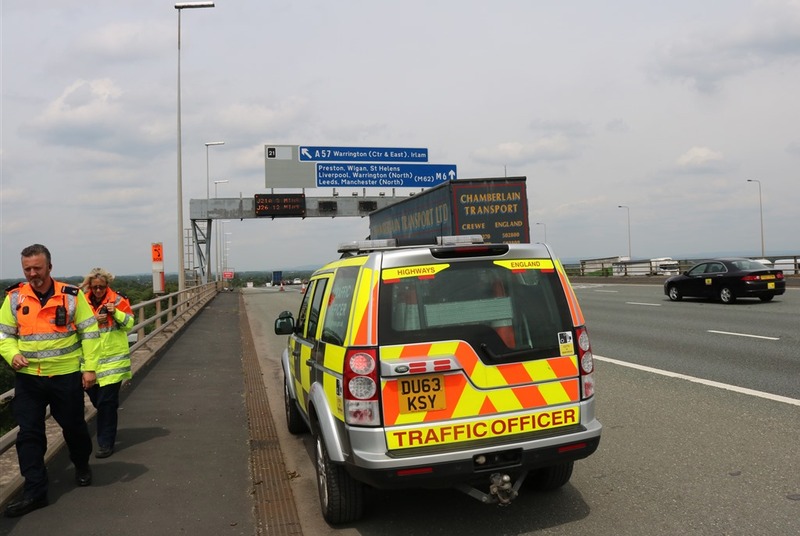 Here we stop on the bridge to check on some Highways Maintenance trucks which are clearing up roadside rubbish as well as observe conditions on the bridge. In the wind and with feet planted, the bridge can be felt swaying and at first I think I’ve got vertigo but no, it’s just the sensation of it gently moving. Our tour takes in some of the most notorious and troublesome parts of the M60 – the Eccles Interchange, Trafford Park – but as we’re in the relative quiet of the afternoon the traffic is flowing freely. This allows us to talk about a few things such as the 50mph limit for smart motorway road works that has been in effect since 2014 (and yes it will be completed by Christmas I’m told), the logistical nightmare involved in responding to weekend issues on the M60 if there is something on at Event City / people are visiting the Trafford Centre / there’s a rugby game on at the AJ Bell stadium, as well as the amount of people who run out of fuel on the motorway and the knock-on effect that can have on rush hour traffic. It was interesting to get these insights directly from the people who are often the first responders to any incident these roads can throw at drivers. Though we may get annoyed at stop-start traffic, people cutting us up or variable speed-limit signs, it is these men and women who deal with the consequences as a result of bad road behaviour. The next time I see them on the road, I'll give them a nod of respect, knowing that little bit more about how they make the roads safer.